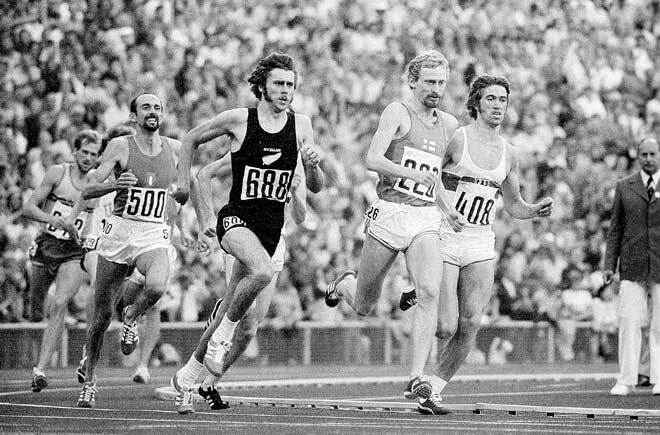 Rod Dixon (foreground, in black) was a top New Zealand runner in the 1970s. He produced a string of world-class performances from the 1,500 metres up to the marathon. Here he is running the 1,500 metres at the 1972 Olympics in Munich. He finished third in the final, winning a bronze medal. Also visible, on Dixon's left, is Pekka Vasala from Finland, who won the final. The photo above shows not the final, but semifinal of the 1972 Olympics in Munich. The picture shows some people that were not in the final. For example, Franco Arese (Italy, No 500), and the Swedish runner Gunnar Ekman behind him. Leading in front of Dixon are the eventual Olympic champion Pekka Vasala from Finland (No 226)and Paul-Heinz Wellmann (West Germany, No 408). Shadowed behind Dixon is Brendan Foster of Great Britain (he made the final), and shadowed behind Arese is Robert Wheeler of USA (he did not).